Eight out of ten hunters hate safety gear. Let's just say what's on everyone's mind. Most hunters don't use tree safety products because they're awkward to put on, noisy and hinder the hunting experience. So, we created Tree Spider and re-defined the entire category. The Tree Spider Outfitter SpiderWeb provides unprecedented ease of use, comfort, stealth and mobility. 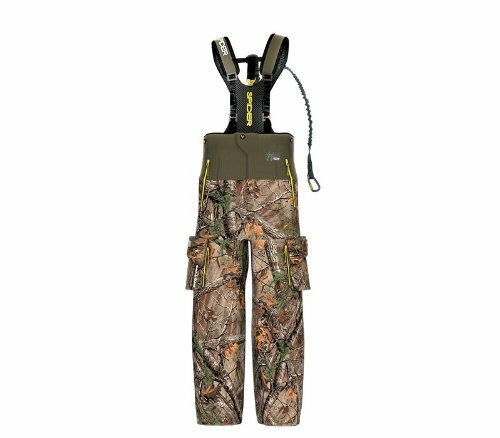 It'a patented and exclusive safety harness system inside of a top quality ScentBlocker hunting garment. SpiderWeb's removable bungee tether provides shock absorption, control, flexibility, and security with ShockBlocker which reduces the fall arrest force felt by the body by up to 40%. Designed to disappear into the experience, micro-brushed fabric is soft and quiet. The fabric is 100% waterproof and breathable with RainBlocker technology, and also has scent control with Trinity technology. The garment features adjustable shoulder straps, contoured and padded shoulder straps and upper back panel and climbing loops that tuck away when not in use with side snap opening. There is a diamond crotch gusset for maximum mobility. The SpiderWeb is extra functional with (2) zippered slash pockets at waist, (2) cargo bellow pockets with zippered side entry and (1) rear snap pocket. Includes tree strap, removable tether, carabineer, suspension relief strap and instruction manual. Light, quiet, easy, fast. Tree Spider kills every excuse hunters have for not taking safety seriously. If you have any questions about this product by TREE SPIDER, contact us by completing and submitting the form below. If you are looking for a specif part number, please include it with your message.